Make movie night at home even more special by adding homemade cheddar seasoning to your popcorn. Watch as your family smiles with delight upon taking their first bites of this unexpected, flavorful treat. Cheddar popcorn seasoning requires inexpensive ingredients and only takes a few minutes to make. However, you may wish to double the recipe, because your family will surely ask for seconds. Remove the saucepan from the heating element and stir in the cheddar cheese powder, ground mustard and paprika until thoroughly blended. 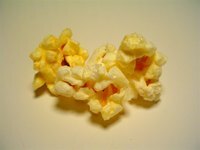 Place the popped popcorn in a large bowl and pour the melted ingredients over it. Stir the popcorn promptly with a wooden spoon to evenly distribute the cheddar seasoning. Sprinkle salt and pepper over the popcorn, if desired. Serve the cheddar popcorn immediately. For spicier cheddar popcorn, substitute ground cayenne pepper for the paprika. If you cannot find cheddar cheese powder at your grocery store, use the cheddar cheese packet from a box of macaroni and cheese.